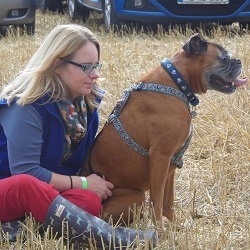 My animal healing story started the day I met my Boxer dog Bruce in 2006. He was a natural ‘healer’ dog and he taught me the ability and benefits of how natural healing can help both humans and animals alike. What is Animal Healing and how can it help? 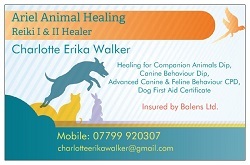 Animal healing is a non-invasive complementary therapy, suitable for a wide range of physical and emotional conditions. It can work very well in conjunction with other complementary treatments such as manual therapies like physiotherapy. It also compliments alongside on-going veterinary treatment. Healing does not provide a diagnosis and veterinary treatment must be sought for any condition or illness present (or suspicions of a condition or illness). Animals have a natural curiosity and want to receive healing and as they do not have any preconceived ideas they are non-judgemental of the ability of the healing treatments. This makes them the most wonderful candidates and it is a pleasure working with them. It is just natural to them. Reiki is a Japanese technique for promoting healing and it also reduces stress and increases relaxation. All living beings have energy; humans, animals and plants. This is known as ‘life force energy’ or ‘Chi’ by the Chinese, it flows through us and keeps us alive and well. If one’s ‘life force energy’ or ‘Chi’ is low, then we are more likely to get sick or feel stress, and if it is high, we are more capable of being happy and healthy. 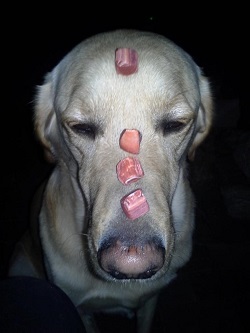 All living beings have chakras. There are 7 main chakras roughly along the centre of the body that govern our responses on many levels to the energy around us. Each of these Chakras are linked to the living being’s physical and / or emotion state. Crystal Healing is a holistic, non-invasive, vibrational energy-based system of healing. It does not imply a cure. Crystal healing means bringing the mind, body and spirit back into harmony, restoring the body’s natural rhythm and equilibrium. It treats the whole being and their integrated energy system. It is therapeutic and deeply relaxing. The technique uses precisely placed crystals either on and / or around the physical body. The crystal colours more often than not are related to the colours relating to the Chakras. So, the crystals chosen often give insight into the ‘problem’ areas of the body. Initial consulation (with treatment): £45 for 90 minutes. Further treatments: £30 for 60 minutes / £20 for 30 minutes. In Distance Healing, I will contact you before the session to carry out the intial consultation. You will inform me of all the information you can give me about your pet so that when it comes to Distance Healing I can concentrate on the required areas of healing. Distance Healing treatments: £25 for 60 minutes / £15 for 30 minutes.